Kansas State is off this week getting ready for the big Thursday night match up against West Virginia, so I got a swath of college football to watch that doesn’t feature my favorite team. But there is a good handful of important games as well. The biggest of which being a game from the SEC. I’ll take it, but I’ll be doing it with a heavy cow bell heart. So I guess were are going with the Top 25 first. Ohio State is looking to stake a claim to playoff glory by taking out a barely ranked Minnesota. Jerry Kill will shake, shake, shake it off. Clemson is at Georgia Tech and I guess I’ll go for the Tigers. Nebraska is taking on Wisconsin for the “Freedom Trophy”. Freedom isn’t free but I believe the Cornhuskers are free to win. Georgia is putting one on Auburn big time as they are sliding off the playoff stint like Ole Miss did. 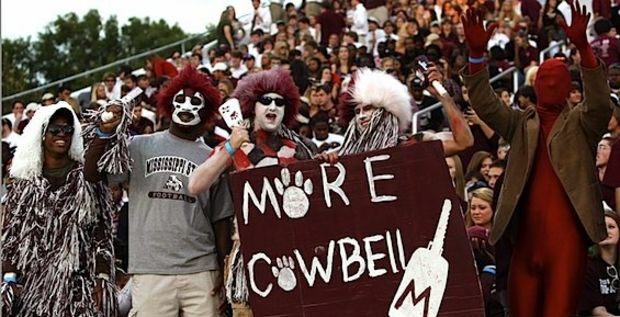 So Mississippi State is heading to Alabama in a big college football playoff tussle. The big surprise this year is Mississippi State. This is their chance to stay at the top of the stack. At the other end of this match up, Alabama is trying to take their namesake and pop it back into the playoff. They can do it with a win. Who will win? I’m going Clanga because of alot of emotional and illogical reasons. Mainly because we need some new blood up in there. Clanga! Okay I spent entirely too long talking SEC it’s time to get back to the Big 12. Oklahoma is going to roll Texas Tech. Texas at Oklahoma State may actually be more interesting. For some reason I think the Longhorns will be bowl eligible after this weekend. Finally it’s TCU at Kansas and man alive they are going for style points this week. It will be a laugher. That’s about it. Last weekend I was partying at Fun Fun Fun Fest and missed the beat down TCU served on Kansas State. I’ll probably watch some of the beat down TCU will serve on Kansas. I’ll also be watching a game that will make big waves for the college football playoff. Finally: Clanga!